A wait before called to action but in the late afternoon of Sunday 7th October it was success for Egypt’s Youssef Abdel-Aziz and Ioannis Sgouropoulos of Greece, as it was for Romania’s Cristian Pletea and Singapore’s Pang Yew En Koen, all prominent names in the Men’s Singles event at the Buenos Aires 2018 Youth Olympic Games. In their only matches of the day, all recorded most creditable wins. Youssef Adbel-Aziz, the no.7 seed, beat Azerbaijan’s Yu Khinhang, the no.24 seed (11-8, 5-11, 11-8, 11-6, 14-12); at the same time, Cristian Pletea, the no.9 seed, prevailed in opposition to New Zealand’s Nathan Xu, the no.26 seed (11-7, 11-9, 11-5, 11-1). The example set, Ioannis Sgouropoulos, the no.8 seed, followed suit by overcoming Germany’s Cédric Meissner, the no.23 seed (8-11, 11-1, 11-4, 7-11, 11-9, 11-4); rather more comfortably, Pang Yew En Koen, the no.10 seed, accounted for Nigeria’s Azeez Solanke, the no.28 seed (11-7, 11-7, 11-8, 11-7). Success as seeding predicted and that was very much the order of proceedings as, on the opening day play, the Men’s Singles event came to a close; the one exception was the defeat of the host nation’s Martin Bentancor, the no.20 seed, by DPR Korea’s Kim Song Gun, the no.32 seed (11-9, 11-8, 11-9, 11-9). Otherwise it was success for the higher rated with Russia’s Vladimir Sidorenko catching the eye. The no.19 seed, he overcame Korea Republic’s Cho Daeseong, the no.29 seed (11-8, 11-7, 13-15, 11-9, 12-10), the player who earlier in the day had caused somewhat of a surprise by beating Thailand’s Yanapong Panagitgun, the no.13 seed (11-5, 11-7, 11-8, 11-6). Alas for Yanapong Panagitgun it was a day not blessed with the best of fortunes; in his concluding day encounter he was beaten by Chinese Taipei’s Lin Yun-Ju, the no.4 seed (11-9, 11-4, 13-11, 11-4). 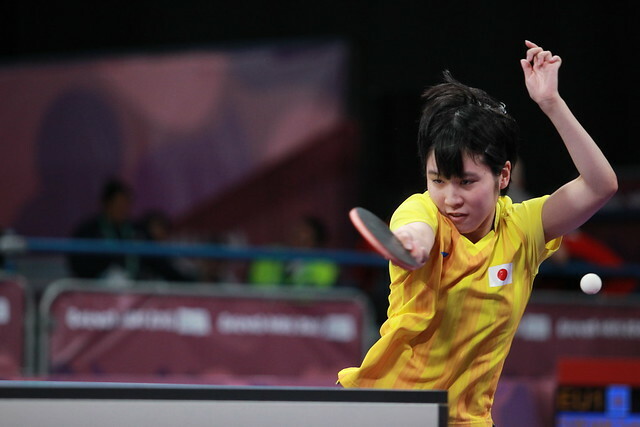 The win meant Lin Yun-Ju ended the day unbeaten as did the three players listed higher; Japan’s Tomokazu Harimoto, Kanak Jha of the United States and Sweden’s Truls Moregard all ended matters in positive fashion. Tomokazu Harimoto, the top seed, beat Brazil’s Guilherme Teodoro, the no.16 seed (11-4, 11-7, 11-7, 11-7); similarly Kanak Jha, the no.2 seed, overcame Chile’s Nicolas Burgos, the no.14 seed (11-8, 11-4, 8-11, 9-11, 11-1, 11-8). Not to be upstaged, Truls Moregard, the no.3 seed, proved too strong for Italy’s Matteo Mutti, the no.15 seed (11-7, 11-2, 13-11, 16-14). Play in the Men’s Singles group stage concludes on Monday 8th October.